Having attended previous meetings of the Rotterdam Convention, I am well aware that keeping track of all the developments as they unfold is impossible. There are plenary meetings, side events, workshops, discussion groups, gatherings of specific groups such as trade unionists or representatives of regional groups etc. In addition, there are exhibition booths to visit, press conferences to attend and conversations to be had with national delegates and/or representatives of the Rotterdam Secretariat and other agencies.1 Suffice to say that with the best will in the world, nobody can cover everything at the Conference of the Parties to the Rotterdam Convention (COP7). Colleagues in Geneva this week monitoring developments regarding the listing of chrysotile asbestos on Annex III of the Convention have, however, sent back a stream of information. This has been received against an outpouring of condemnation by victim support groups, trade unions, campaigning bodies and non-governmental organizations of the asbestos industrys attempts to torpedo the Convention. Those with vested interests attending COP7 come from Russia, India, Ukraine, Kazakhstan, Canada, Vietnam, Mexico, Colombia and Brazil.2 The propaganda they have brought with them to the meeting is available in English, Russian and Portuguese and comes under such headings as: People for Chrysotile, No Chrysotile Ban, Chrysotile Forever and Science  Basic Facts. This morning (May 13, 2015) in Geneva, the first plenary session discussion about listing chrysotile took place. Reports have been received that the countries opposed to the listing included: Russia, Kazakhstan, Kyrgyzstan, Zimbabwe, Pakistan, Cuba, India and Belarus (a non-party to the Convention). The reasons given for the veto on listing by the pro-asbestos delegations included the following: there was, they said, no adverse health impact of asbestos exposure, asbestos was essential for use by poor people, there was no new scientific evidence supporting inclusion, chrysotile products were less hazardous than the alternatives and it was possible to use chrysotile safely. In a surprise move, the delegation from Brazil, the worlds third biggest producer of chrysotile asbestos, declared its support for listing. Although India had at a previous meeting supported the inclusion of chrysotile asbestos on Annex III of the Convention, they have re-joined the asbestos refusniks this time round. They must have found it quite uncomfortable to do so in the presence of Mr. Sharad Vittnal Sawant, one of their compatriots whose life has been shattered by asbestosis. Mr. Sawants intervention was greeted with applause from delegates and jeers from at least one industry lobbyist. 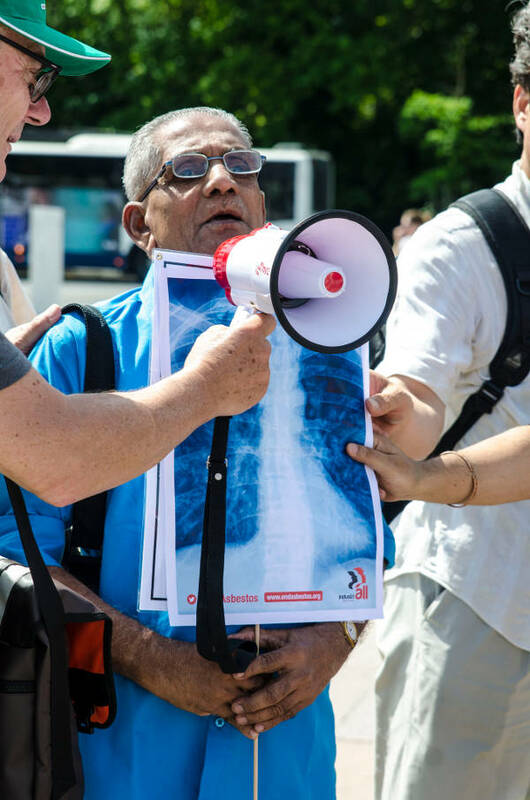 Yesterday, Mr. Sawant took part in a colourful and lively ban asbestos demonstration in the iconic square outside the conference in La Place de Les Nations. His comments in Marathi and Hindi were translated into English by Pralhad Malvadkar, Coordinator of the Occupational Health and Safety Centre in Mumbai. Mr. Sawant spoke about two decades of occupational exposure to asbestos and the health problems which resulted for both himself and his wife. He said that to protect future generations, the time had come to stop using asbestos. Do not be deceived by the lies of the asbestos industry  all forms of asbestos kill. Chrysotile is not somehow magically different from other forms of asbestos, and saying so will not make it so. The global labour movement has looked at the science, has looked at our dead and dying sisters and brothers, and we demand a global ban on all forms of asbestos. Joining in the trade union manifestation yesterday afternoon were activists from organizations which have long been part of the international ban asbestos network; they included the Asia Monitor Research Center, the Asian Ban Asbestos Network, the Asian Citizens Centre for Environment and Health, Women in Europe for a Common Future, the Rotterdam Convention Alliance, the Ban Asbestos Network of Korea, the Vietnam Ban Asbestos Network, the Occupational Health and Safety Centre (Mumbai, India), ANDEVA  an umbrella group representing French asbestos  and the Asbestos Diseases Foundation of Australia. 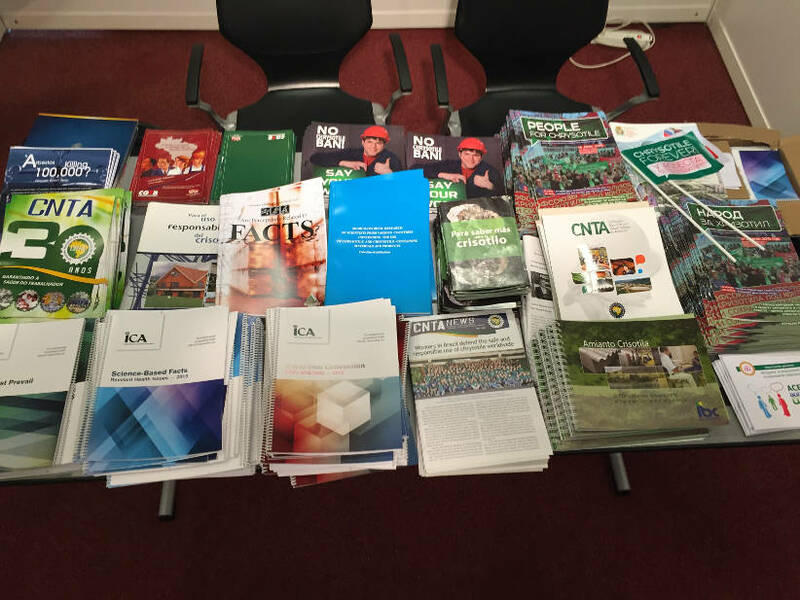 This afternoon (May 13, 2015), from 13:15 to 14:45 an asbestos side event entitled Chrysotile Asbestos  Who Pays the Bill was held by the Rotterdam Convention Alliance (ROCA)  in Room 3. After unpleasantness at an asbestos side event in 2013, security guards were on hand at the beginning of the session in case asbestos lobbyists attempted once again to disrupt proceedings; fortunately, this time, there was no trouble. The keynote speaker was Dr Elizabet Paunovic, head of WHO European Centre for Environment and Health, who made her presentation via a video recording. Other speakers included campaigners from Korea, Hong Kong and Vietnam who described the silent epidemic of asbestos-related diseases affecting workers and members of the public in Asia. Russian asbestos packaging was exhibited as well as slides showing the impossibility of achieving the safe and controlled use of asbestos. Progress being made in Vietnam towards the achievement of an asbestos ban by 2020 was discussed. 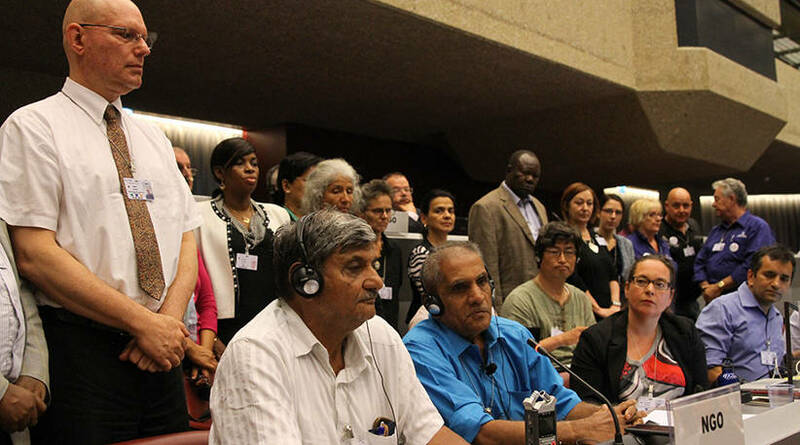 During the session, there was a screening of the new WHO film: Chrysotile Asbestos  Voices from South-East Asia. Asbestosis victim Sharad Vittnal Sawant told his personal story to delegates at the side event, describing working conditions in the factory where he was exposed to chrysotile asbestos. 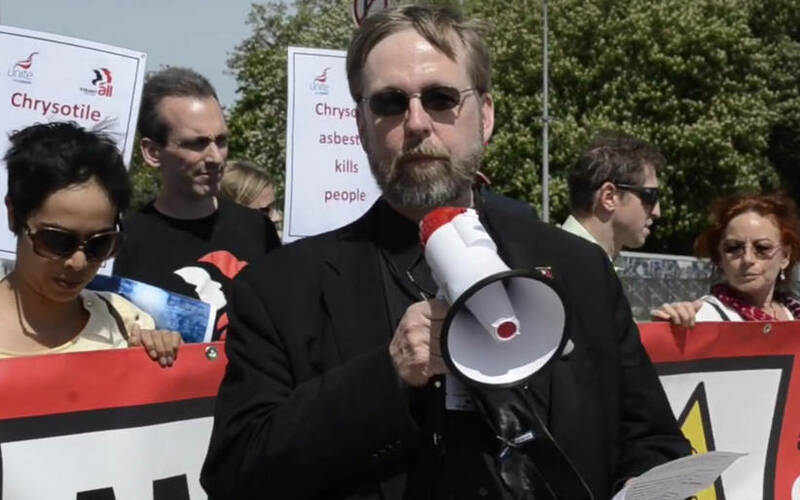 During his remarks, one of the asbestos thugs accused him of spouting propaganda. Before COP7 even began, it was clear that the industry lobby intended to manipulate procedural technicalities to achieve their goals despite the fact that under the terms and rules of the Convention, chrysotile should be listed on Annex III. After this mornings plenary session, there will be intercessional meetings and discussions with a view to relieving the logjam. Whatever happens there, mobilization by grassroots activists and labor organizations at COP7 has exposed the industrys dirty and deadly intentions for all to see. This is not over. 1 Kazan-Allen L. The Rotterdam Convention - An Activist's Diary. May 21, 2013. 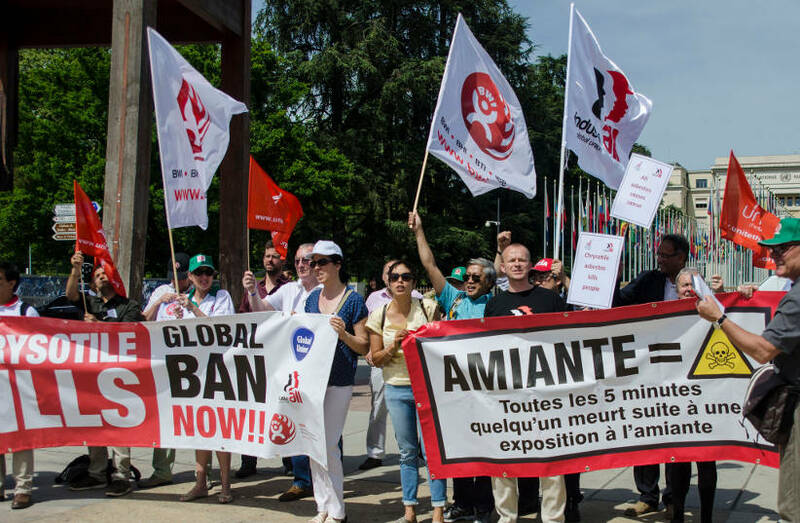 2 Workers from Around the World Gathered in Geneva to Support the (sic) Chrysotile Asbestos. May 12, 2015. 3 Global union action against asbestos. May 15, 2015.